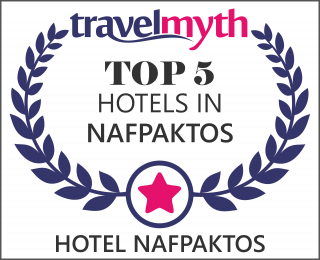 Hotel Nafpaktos is one of the most historic hotels in Nafpaktos. It is built on one of the two beaches of the city, offering direct access to both the sea and the historical center of Nafpaktos with its wonderful Venetian harbor. The staff of our hotel is composed of experienced executives in the tourism industry, and the long-term cooperation and bonding between them has created a family atmosphere that comes to perfectly complement the professionalism of the services provided. Our breakfast as well as the products of our bar and cafeteria are prepared exclusively in our hotel offering “homemade” care and tastes to our guests.The certification of our unit from ISO 9001: 2015 as well as our cooperation with professional Hotel Unit Advisors (Member of My Choice @ Greece Network) ensure the continuous upgrading and modernization of our services. Our high rating on platforms such as Booking.com and TripAdvisor is just a small reward for our efforts and efforts with the most basic creation of friendship ties with our customers from all over the world. Come to meet our team, our hotel and maybe one of the most beautiful cities in Greece, Nafpaktos.